Chicago Zoological Society - Otterly Adorable Pups! HomeBlogs Center for the Science of Animal Care and Welfare April 2017 Otterly Adorable Pups! 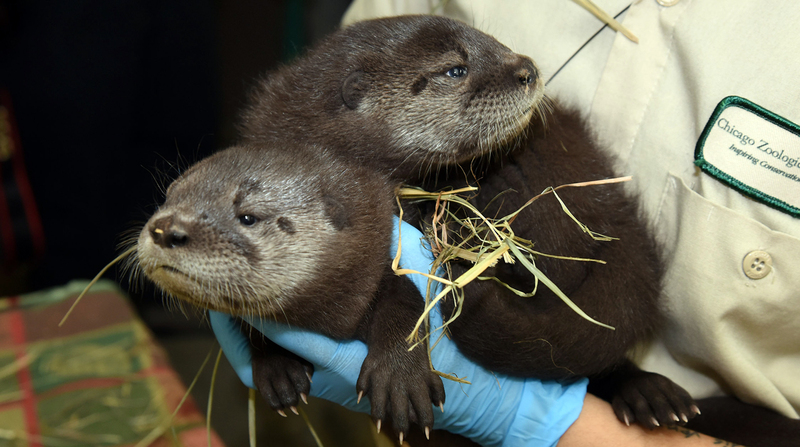 History was made recently at Brookfield Zoo, with the birth of twin North American otter pups. The pups, a male and a female, were born on February 23, making them the first successful births of this species in the zoo’s history. The pups are currently behind the scenes bonding with their mom and learning how to swim. They are scheduled to make their debut later this month. The pups’ mother, Charlotte, arrived in June 2012 from Omaha’s Henry Doorly Zoo in Nebraska, while the father, Benny, joined the zoo family from Dickerson Park Zoo in Springfield, Missouri, in August 2004. Otter mating typically occurs between December and April, with most births occurring between February and April of the following year. Pups are born with their eyes closed, fully furred, and weighing about 4 ounces. The Chicago Zoological Society is a participant in the Association of Zoos and Aquariums’ (AZA) North American River Otter Species Survival Plan (SSP), which is a cooperative population management and conservation program for the species. The program manages the breeding of otters in zoos to maintain a healthy and self-sustaining population that is both genetically diverse and demographically stable. Otter populations that were once in jeopardy in many places are recovering nicely, some from animals moving in from elsewhere (such as those in and around Cook County) and some from reintroduction programs over the last 20 years. The International Union for Conservation of Nature (IUCN) lists these otters as least concern, meaning that the populations are very stable.